To Cite: Nouri M, Asefi S. Effect of Chronic Nasal Airway Obstruction on Maxillary Arch Form in Monozygotic Twins: A Case Report, Iran J Ortho. 2014 ; 9(3):e4850. doi: 10.17795/ijo-3745. Introduction: The role of nasal septum in development of the maxilla after birth remains to be a question. Study of monozygotic twins may elucidate the role of epigenetic factors in growth and development of craniofacial structures. 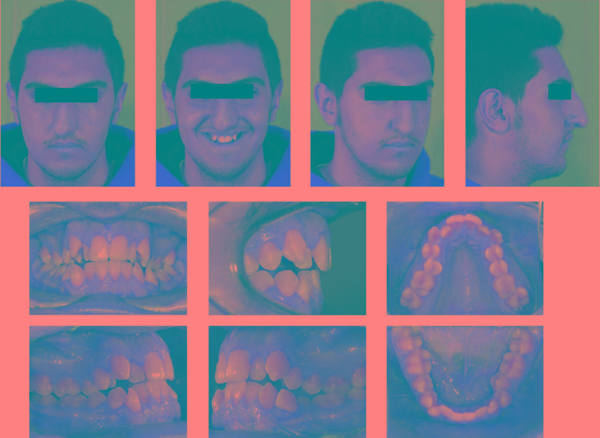 Case Presentation: Herein, we report a case of 16 year-old male monozygotic twins with Angle class III malocclusion and high angle facial pattern. One of them (patient M.H) had a history of mid-face trauma at the age of 6. Radiographic and clinical examinations revealed significant nasal septum deviation and the patient demonstrated nasal airway obstruction on the right side. The effects of this traumatic injury and the consequences of septal deviation were evident both clinically and radiographically at the age of 16. Increased airway resistance caused by septal deviation significantly affected the arch form and the configuration of the nose. The overall facial growth pattern is predetermined genetically but vertical dimension of the face may be more influenced by the environmental factors. Conclusions: Patients should be carefully monitored after trauma to the nose and face and any deviation in the facial structure should be treated promptly in order to prevent asymmetries. The relationship of mouth breathing (MB) with morphological disorders has long been established. According to the functional matrix theory introduced by Moss (1), nasal breathing allows for adequate growth and development of the craniofacial complex and proper masticatory function and deglutition (2). Animal studies have yielded evidence on the role of MB in abnormal dentofacial growth. Data showed that adaptive changes occurred in the form and size of the maxillary and mandibular dental arches in response to alterations in the positions of the head, mandible and tongue. A theory on the role of chronic nasal obstruction in facial growth states that change in the normal nasal airflow and internal pressure of the nasal and oral cavities alters the downward growth of the palate. Another theory discusses that MB due to nasal obstruction encourages a low tongue posture and pushes the mandible down. This posture can affect the skeletal relationship and the soft tissue profile. Consequently, unequal compressive loads are applied by the buccinator and perioral muscles and particularly affect the maxillary posterior teeth (3). Clinical epidemiological studies have shown that respiratory obstruction may be found in patients with different facial types. Thus, patients with respiratory obstruction may have different types of malocclusion with higher occurrence of class I malocclusion compared to class II malocclusion. In a study by Quick and Gundlach, nasopharynx disorder was found in 63% of the long-face (high angle) and 23% of the short-face (low angle) patients. Long face subjects had significantly higher incidence of nasal obstruction symptoms due to unknown causes. The nasopharynx cavity was smaller in long-face subjects (4). Linder-Aronson and Backstrom (5) confirmed the above-mentioned results and did not find a direct association between MB and type of malocclusion especially with regard to overbite and overjet. Classically, patients with MB have a narrow, V-shaped maxillary arch, maxillary palatal vault, proclined maxillary teeth, class II occlusal relationship and open bite (6). Changes in dental arch dimensions such as change in palatal vault depth, decrease in intercanine and intermolar widths and changes in teeth positions are expected following the conversion of nasal breathing to MB (7). Evidence shows that normalizing the breathing mode in children resulted in dentofacial growth similar to that in nasal breathing controls. It has been well accepted that elimination of tissues obstructing the upper nasal airway early in the prepubertal stage encourages a positive change towards harmonious and symmetrical facial growth (7). Several theories have been suggested regarding the role of nasal septum in craniofacial development. It has been well established that until the age of 6, downward and forward development of the maxilla is mainly influenced by the growth of the cranial base, determined genetically. After the age of 7, posterior-anterior maxillary sutural growth is the only mechanism for developmental movement of the maxilla. These sutures respond to soft tissue tension (functional matrix theory) and the tension caused by the growth of cartilaginous nasal septum (8). Grymer and Melsen showed that the anterior malformations of the cartilaginous septum in twins were acquired rather than congenital (9). In another study by the same group of researchers on 42 monozygotic twins between 18 to 22 years, it was found that the anterior septal deformities resulted in underdevelopment of the nasal cartilage and a shorter anteroposterior dimension of the maxilla; whereas, they had no effect on vertical facial dimension. Thus, it was assumed that the vertical facial dimension is determined genetically. The vertical dimension of the face is a variable with the highest correlation with nasal resistance. The lower the height of the maxilla, the greater the resistance. They believed that facial morphology is influenced by the development of the anterior cartilaginous septum and changed nasal resistance is a secondary consequence of this phenomenon (10). This study aimed to assess the effect of nasal septum deviation on growth and development of the craniofacial system and dental arch in monozygotic twins. Male 16 year-old monozygotic twins presented to a private orthodontic office complaining of dental crowding are presented in this case report. They mentioned no systemic disease or drug intake in their medical history. Extraoral clinical examination of both patients revealed dolichocephalic form of the head and leptoprosopic facial form (Figures 1 and 2). In frontal view at rest, both patients had asymmetric facial features and competent lips with no strain of the facial or perioral muscles. Both patients had increased mid- and lower facial heights. Patient one (M.H) had a severe nasal septum deviation on the right side and added a history of mid-face and nasal trauma at the age of 6. Further clinical examination revealed that the patient was not capable of exhaling the air through the right nasal cavity; whereas, the left nasal cavity was normal during an intentional exhalation. The patient admitted absence of nasal breathing and that he sleeps with his mouth wide open. Further examinations revealed that the patient had habitual MB although the left nasal cavity showed no resistance to exhalation. In the frontal smiling view, both patients had adequate incisal and gingival show. In the second patient (A.H), the maxillary dental midline coincided with the facial midline and also the mandibular dental midline. But, the first patient (M.H) had 1 mm of maxillary dental midline deviation towards the left relative to the facial midline. Nasal septum deviation towards the right in this patient exaggerated his dental midline deviation. In this patient, the maxillary and mandibular dental midlines coincided. 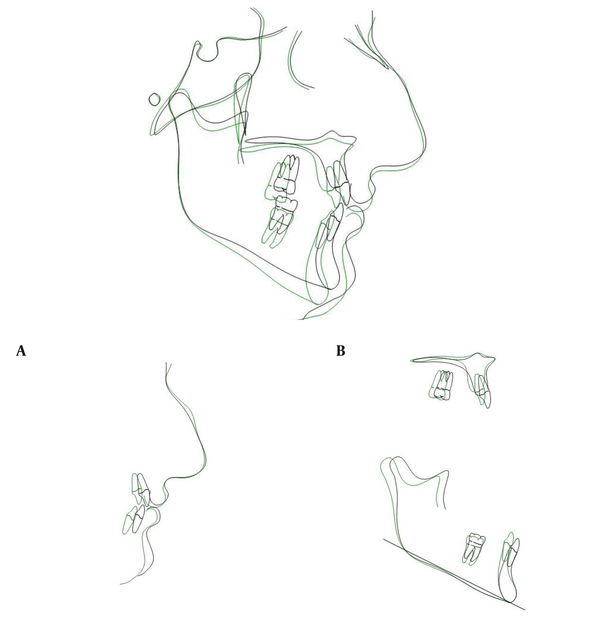 Assessment of buccal corridors revealed that both patients had negative space above the normal limit, which was more significant in the first patient (M.H). With regard to the facial profile, both patients had steep foreheads, shallow radix and nose hump. Nose hump was more significant in the first patient (M.H). The nasolabial angle in both patients was obtuse and both the upper and lower lips were retruded relative to the E-line. 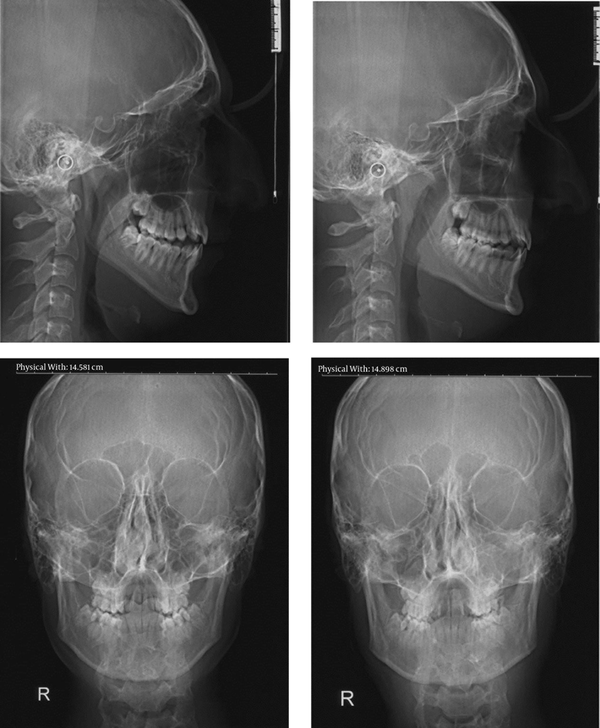 In both patients’ facial profile, the inferior border of the mandible was severely steep relative to the horizontal line, which indicated the vertical growth pattern. The second patient (A.H) had greater amount of submental fat and a more obtuse mentocervical angle. Intraoral examinations revealed that the second patient (A.H) had class I Angle malocclusion with coincidence of the maxillary and mandibular dental midlines (Figures 1 and 2). The maxillary and mandibular arches were ovoid and showed asymmetry due to higher constriction of the arch in the left maxilla and the right mandible. The patient had bilateral anterior crossbite of the lateral incisors and posterior crossbite of the left first molars. But, the second molars of the maxilla were in crossbite. The space shortage was 3 mm in the maxillary arch and 4 mm in the mandibular arch. Also, the patient had +1 mm of overjet and overbite. The first patient (M.H), had class I molar relationship in the right and class III molar relationship in the left side and also class III canine relationship in the right and class II canine relationship in the left side. The upper and lower midlines coincided. The maxillary arch was tapered (triangular) and the mandibular arch was squared and they were asymmetric due to bilateral constriction of the maxillary arch and right quadrant of the mandibular arch and also slight skewness towards the left. The patient also had bilateral anterior crossbite of the maxillary lateral incisors and bilateral posterior crossbite of the premolars of both sides and first molars of the left side. But, the maxillary second molars were not in crossbite. It should be noted that due to the maxillary constriction of the arch in this patient, posterior mandibular teeth of this patient had greater lingual inclination than the other (A.H) patient in order to compensate for the transverse discrepancy and enable efficient mastication. The space shortage was 4 mm in the maxillary arch and 9 mm in the mandibular arch. The amount of overjet was +2.5 mm and overbite was +1 mm. Crowding of the maxilla was mainly concentrated in the anterior segment. Posterior bilateral constriction of the maxillary arch was also present, but without significant crowding. In the mandible, crowding was mainly at the right canine and left premolar regions. Intercanine and intermolar widths, canine depth and molar depth are also shown in Table 1. Panoramic radiographs (Figure 3) showed permanent dentition with no pathology in both patients. Half the roots of the third molars in all four quadrants had been formed, which was compatible with their chronological age. In both patients, third molars had a vertical position. The first patient (M.H) showed greater maxillary sinus pneumatization compared to the other patient; the anterior border of the maxillary sinus had extended to the mesial root of the canine teeth bilaterally. Right side patient M.H’s and left side A.H’s panoramic view, lateral cephalometric and posterior-anterior cephalometric radiograph with similar class III high angle facial pattern. Patient M.H’s has obvious nasal septum deviation to right and complete obstruction. Tracing of lateral cephalograms (Figure 4) was done by Dolphin digital imaging software version 10.5. Table 2 compares the two patients with one another and also with the anatomical norms. The first patient (M.H) showed a long-face pattern with an increased sum of posterior angles (404.5°). This increase was mainly due to the increase in the gonial angle (127.7°). The ratio of the posterior to the anterior facial height was 61.6%. However, the second patient (A.H), despite having similar genome and living conditions, had almost normal facial pattern (sum of posterior angles: 397.3°), with a gonial angle of approximately 120°, which was close to normal. The ratio of the posterior to the anterior facial height was 57.2%. The SN (sella-nasion)-mandibular plane angle in the first patient (M.H) was 44.5° (FMA = 34.3), which was 7.2° higher than that in the second patient (A. H) (37.3° and within the normal range, FMA = 28.4). The ANB angle was 1.2° in the first patient (M.H) and 1.4° in the second patient (A.H). One major difference between the two patients was in their ramus height (Ar-Go). In the first patient (M.H), ramus height was significantly shorter (5.7 mm) than that in the second (A.H) patient. The body of the mandible was also 3.1 mm shorter in the first (M.H) compared to the second (A.H) patient. Considering the class III tendency to convert to class I skeletal pattern in both patients, dental compensations in the form of reductions in U1-SN and IMPA values were noted; these reductions were much more significant in the first (M.H) patient. A) Soft tissue and relative incisors position of twins. 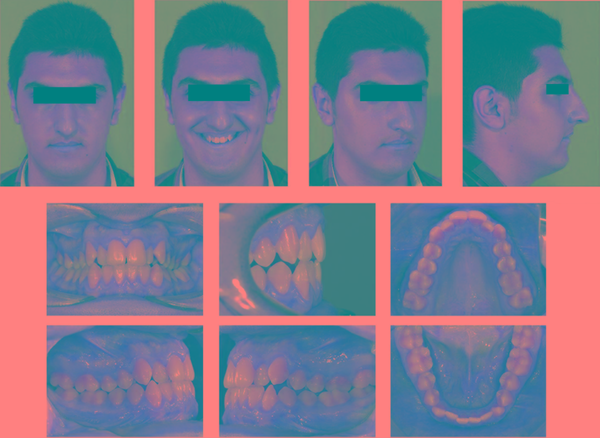 B) Isolated maxillary and mandibular superimposition of twins (Green: Patient M.H, Black: Patient A.H). After noticing nasal obstruction in the first (M.H) patient and presence of facial asymmetry in both patients, Posterior- anterior (PA) cephalograms were ordered for them and the differences in their PA cephalograms were also evaluated (Figure 3). Table 3 shows the analytical values in the two patients in comparison with the standard values. The second (A.H) patient had greater bizygomatic width; however, this width was smaller in the first patient (M.H) and the main compensation for the respiratory obstruction occurred via an increase in the anterior-superior facial height, which relatively decreased the posterior facial height and resulted in clockwise rotation of the mandible due to opening of the gonial angle. As seen, skeletal width of the maxilla was similar in both patients and this indicates the greater share of dental factors in development of posterior cross bite in the first patient (M.H); he also had increased jugal to gonial angle (J-GA) distance compared to his brother (A.H), which is also in conformity with the increased facial vertical height. Consequently, by an increase in facial height, the distance between the right and left gonial angles (GA-AG) relatively decreased in this patient (M.H), which is one characteristic of subjects with vertical growth pattern. An interesting point to mention is that both patients had similar skeletal mandibular midline deviation towards the left, which was not clinically significant. Decreased intermolar and intercanine widths in the maxilla were among the dental compensations observed in the first (M.H) patient, which were significantly more noticeable compared to the second patient (A.H). In the mandible of the first (M.H) patient, linguoversion of the buccal segments was noted; which was probably due to masticatory function. In response to the pressure by the buccinator muscles, the molar teeth had lingual inclination; however, despite the reduction of the intercanine width, lingual inclination in this region was less prominent. Comparison of the posterior-anterior view of the twins revealed that the overall impact of nasal obstruction on the right side of the nose of the first patient (M.H) due to facial trauma at 6 years of age was more prominent on the intermolar width of both jaws. Intercanine width was also affected but to a lower extent in the mandible. Due to nasal obstruction on the right side, both dental midlines were deviated in the first patient (M.H), which was more noticeable in the maxilla. An increase in the vertical drift of upper molars was seen on both sides but a small cant was seen at the right side indicating more growth. The skeletal width was smaller in the patient with obstruction at the porion (4 mm). This was also evident in the jugular part but to a lesser degree. The width of the mandible was greater in the affected twin. In the profile view (Figure 4), the overall growth pattern of twins was hyper-divergent with an increase in the first patient (M.H). The affected twin had an increased anterior facial height. The jaw bases showed a divergent growth pattern. An increase in basal and mandibular plane angles was also noted, which caused a mandibular retrognasia skeletal relationship in the first patient (M.H). The upper and the lower incisors were upright in the twins but the value was higher in the affected twin. Both lips were retrusive; although the upper lip retrusion was more prominent in the affected twin. It seems that the septal deviation and the nasal obstruction caused by the trauma had the most significant impact on tooth inclination and arch width of the maxilla. The most significant effect on the skeletal pattern was related to the vertical growth of the mandible and a significant backward rotation was seen. The body length was shorter in the affected twin. Comparison of the effects of nasal obstruction on twins in our study with the results of other studies reveals two different aspects to be considered: First is the effect of nasal obstruction on the craniofacial growth. Grymer and Bosch (11) reported a saddle nose, an upward displacement of the anterior part of the nasal cavity, and a retrognathic maxilla due to decreased antero-posterior maxillary growth. In our study, the affected twin had all the abovementioned symptoms; but a dolichocephalic growth pattern also existed in the twins that seemed to be intensified by the obstruction. Caixeta et al. (7) reported a deeper palatal vault, a greater mandibular width and a greater mandibular length in children with MB in Brazil. In our affected twin, all these were present except for the greater mandibular length; moreover, the mandibular vertical growth was more prominent in our patient. Grymer and Bosch (11) agreed that nasal obstruction causes a reduction in height of the maxilla, which was not evident in our study. In contrast, the maxillary height had increased in the affected twin. Yamada’s study was on rats and much earlier in life span. The second aspect to discuss is the effect of genetic versus environmental factors on craniofacial structures. Cassidy et al. (12) evaluated the size and shape of dental arches and assessed their association with heritability estimates generated from intraclass correlations. They found that arch width, depth and tooth angulation were more subject to environmental rather than hereditary factors. This means the least genetic contribution to tooth angulation. This was also demonstrated in our study and the most significant difference in the arch was in the inclinations of different teeth. In our study, the differences in both vertical and transverse dimensions of the molar teeth were obvious between the twins and the least difference was in the sagittal dimension. Brown et al. (cited in Cassidy et al. (12)) also found no significant correlations between arch growth in the mesiodistal and transverse dimensions and concluded that breadth and depth were largely independent of one another and were probably affected by different developmental processes. In our twins, nasal obstruction seemed to have the least influence on the sagittal dimension. This case was treated in postgraduate clinic by Dr. Sohrab Asefi under supervision of Dr. Mahtab Nouri. Financial Disclosure: The authors have no fanatical interest regarding the publication of this manuscript. Funding/Support: The authors did the whole documentation in orthodontic clinic of dental school at Shahid Beheshti university of medical sciences.